Lake Ontario is the smallest and most easterly of the Great Lakes of North America. It is bounded on the north by the Canadian province of Ontario and on the south by Ontario's Niagara Peninsula and the U.S. state of New York. The state of Pennsylvania benefits through being included in its drainage basin. The recent history of Lake Ontario has been affected by wars: Britain gained control of the Lake during the French and Indian Wars while the American Revolution encouraged trade, shipping and settlement in the area. Ontario's major urban and industrial centers, the cities of Hamilton and Toronto, are on its shore. Lake Ontario suffered tremendously from pollution from industrial and agricultural waste. By the 1960s and 1970s the lake was dying. Since that time, environmental concerns have forced a cleanup of these wastes, which has been accomplished through better treatment plants and tighter environmental regulations. Today, Lake Ontario has recovered much of its pristine quality. The name of Lake Ontario is derived from ontarí:io, a Huron word meaning "great lake." 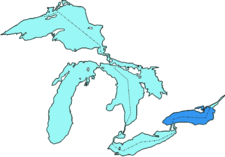 The Canadian province of Ontario was later named after the lake. Previous to its current name, the lake was identified in some maps under different names. In a map drawn in the Relation des Jésuites (1662-1663), the lake has the legend "Lac Ontario ou des Iroquois" and in smaller type "Ondiara." A French map produced in 1712 (currently in the Museum of Civilization ), created by military engineer Jean-Baptiste de Couagne, identified Lake Ontario as "Lac Frontenac." The lake served as the border between the Huron and their vassals and the Iroquois Confederacy in pre-European times. The first documented European to reach the lake was Étienne Brûlé in 1615. Artifacts believed to be of Norse origin have been found in the area, indicating possible earlier visits by Europeans. A series of trading posts was established by both the British and French, such as Fort Oswego in 1722 and Fort Rouillé 1750 (in Toronto). After the French and Indian War, all the forts were under British control. This remained the case even in the years following the American Revolution until the signing of the Jay Treaty in 1794, when forts on the U.S. side of the lake became American. Permanent, non-military European settlement had begun during the American Revolution, preceding settlement on the other Great Lakes. It became a hub of commercial activity following the War of 1812 with canal building on both sides of the border and was heavily traveled by lake steamers, which reached their peak activity in the mid-nineteenth century prior to competition from railway lines. A picture of the Toronto skyline viewed from across Lake Ontario (Niagara-on-the-Lake, ON). Lake Ontario and beach seen from Toronto, Ontario's Humber Bay, west of downtown. Lake Ontario (43°30'N, 78°00'W) is the eastern-most and smallest in surface area (7,540 square miles, 19,529 km²) of the Great Lakes, although it exceeds Lake Erie in volume (393 cubic miles, 1639 km³). It is the 14th largest lake in the world and has a shoreline 712 miles (1146 km) long. Lake Ontario has an elevation of 246 feet (75 m) above sea level. It is 193 miles (311 km) long, and 53 miles (85 km) wide. The average depth is 283 feet (86 m), with a maximum depth of 802 feet (244 m). The Lake's primary inlet is the Niagara River (from Lake Erie) and primary outlet is the St. Lawrence River. Other major rivers which flow into it include the Don River, Humber River, Trent River, the Cataraqui River, the Genesee River, the Oswego River, the Black River, and the Salmon River. Other notable geographic features include Hamilton Harbour, the Bay of Quinte, the Toronto Islands, and the Thousand Islands. The Bay of Quinte separates most of Prince Edward County from the north shore except for a two mile (three km) stretch of land connecting it to the mainland. The largest island on the lake is Wolfe Island located near Kingston, Ontario near the mouth of the St. Lawrence River. It is accessible by ferry from both Canada and the U.S.
A stretch of the Great Lakes Waterway passes through the lake, which is accessible from upstream by the Welland Canal and from downstream by the St. Lawrence Seaway. The Trent-Severn Waterway for pleasure boats connects Lake Ontario at the Bay of Quinte to Georgian Bay of Lake Huron passing through the inland Lake Simcoe. The Rideau Waterway, also for pleasure boats, connects Lake Ontario at Kingston to the Ottawa River at Ottawa. The Oswego Canal connects the lake at Oswego, NY to the New York State Canal System, with outlets to the Hudson River, Lake Erie, and Lake Champlain. A large conurbation called the Golden Horseshoe (including major cities of Toronto and Hamilton, Ontario) is on the Canadian side at the western end of the lake. Other centers on the Canadian side with ports include St. Catharines, Oshawa, Cobourg, and Kingston near the St. Lawrence River inlet. Close to nine million people, or over a quarter of Canada's population, live in the Lake Ontario watershed. 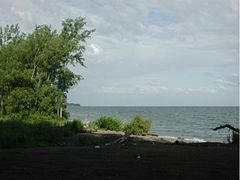 The American shore of the lake is largely rural, with the exception of Rochester, New York and the much smaller port at Oswego, New York. The city of Syracuse is 40 miles inland (65 km) but is connected to it by canal. Over two million people live in Lake Ontario's American watershed. A high-speed passenger/vehicle ferry service across Lake Ontario between Toronto and Rochester was launched on June 17, 2004, using the vessel Spirit of Ontario I. The service was officially canceled in January 2006 after two seasons of financial losses. On the south shore, breezes off the cool lake tend to retard fruit bloom until the spring frost danger is past, and the area has become a major fruit growing area, with apples, cherries, pears, plums, and peaches grown in many commercial orchards on both sides of Rochester. The Canadian part of the south shore, known as the Niagara Peninsula, is also a major fruit-growing and wine-making area located between Stoney Creek and Niagara-on-the-Lake. Apple varieties that tolerate a more extreme climate are grown on the lake's north shore, around Cobourg. Lake Ontario and the other Great Lakes. The lake was carved out of soft, weak Silurian rocks by the Wisconsonian ice age glacier, which expanded the preglacial Ontarian River valley of approximately the same orientation. The material that was pushed southward was piled in central and western New York in the form of drumlins, kames, and moraines that reorganized entire drainage systems. As the glacier retreated from New York, it still dammed the present St. Lawrence valley, so that the glacial lake was at a higher level. This stage is known as Lake Iroquois. During that time the lake drained through present-day Syracuse, New York into the Mohawk River. The old shoreline that was created during this lake stage can be easily recognized by the ancient remnant beaches and wave-cut hills ten to 25 miles (15 to 40 km) south of the present shoreline. When the glacier finally melted from the St. Lawrence valley, the outlet was below sea level, and the lake became for a short time a bay of the ocean. Gradually the land rebounded from the release of the weight of about 6,500 feet (2000 m) of ice that had been stacked on it. It is still rebounding about 12 inches (30 cm) per century in the St. Lawrence area. Since the ice left that area last, that is the area where the most rapid rebound still is occurring. This means that the lake bed is gradually tilting southward, inundating the south shore and turning river valleys into bays. Both north and south shores have shoreline erosion, but the tilting amplifies this effect on the south shore, causing loss to property owners. The lake has a natural seiche (oscillating wave) rhythm of eleven minutes. The seiche effect normally is only about three-quarters of an inch (two cm) but can be greatly amplified by earth movement, winds, and atmospheric pressure changes. Because of its great depth, the lake rarely freezes in winter. The winters of 1934 and 1976 were the only times the lake had ice cover within historic time. When the cold winds of winter pass over the warmer water of the lake, they pick up moisture and drop it as lake effect snow. Since the prevailing winter winds are from the northwest, the southern and southeastern shoreline of the lake is referred to as the snowbelt. In some winters, the area between Oswego and Pulaski may receive twenty or more feet (600 cm) of snowfall. Also impacted by lake effect snow is the Tug Hill Plateau, an area of elevated land that is about 20 miles to the east of Lake Ontario. Tug Hill's elevation, along with ample moisture from the lake, creates ideal conditions for snowfall. The "Hill," as it is often referred to, typically receives more snow than any other region in the eastern United States. As a result, Tug Hill is a popular location for winter enthusiasts, such as snowmobilers and cross-country skiers. The combination of lake-effect snow often reaches inland to Syracuse, which receives more snow annually than any other major city in the U.S. The lake also produces microclimates that have the effect of delaying the onset of fall frost (particularly on the south shore) allowing for tender fruit production in a continental climate. Cool onshore winds also retard early bloom of plants and flowers until later in the spring season, protecting them from possible frost damage. Foggy conditions (particularly in fall) can be created by thermal contrasts and can be an impediment for recreational boaters. During modern times, the lake became heavily polluted from industrial chemicals, agricultural fertilizers, untreated sewage including phosphates in laundry detergents, and chemicals. Some pollutant chemicals that have been found in the lake include DDT, benzo(a)pyrene and other pesticides; PCBs, aramite, lead, mirex, mercury, and carbon tetrachloride. By the 1960s and 1970s the lake was dying, with frequent algal blooms occurring in summer. These blooms killed large numbers of fish, and left decomposing piles of filamentous algae and dead fish along the shores. At times the blooms became so thick that waves could not break. The lake now contains about 360 chemicals that have been identified, as well as many more unidentified chemical pollutants. Since the 1960s and 1970s, environmental concerns have forced a cleanup of industrial and municipal wastes. Cleanup has been accomplished through better treatment plants and tighter environmental regulations: Phosphates were banned from detergents, and farm runoff was regulated more closely. Today, Lake Ontario has recovered much of its pristine quality. For example, walleye, a fish species considered as a marker of clean water, are now found. The lake has also become an important sports fishery, with introduced Coho and Chinook salmon now thriving there. Beaches on Center Island, off Toronto, are popular swimming destinations. A feature on Saturn's moon Titan, which may possibly be a sea of liquid methane, has been named Ontario Lacus after Lake Ontario and is of similar size. Lake Ontario is the only Great Lake that does not border the state of Michigan. In a normal winter, Lake Ontario will be at most one-quarter ice-covered, in a mild winter almost completely unfrozen. Lake Ontario has completely frozen over on only two recorded occasions: during the winter of 1874-75, and in February 1934. Lake Ontario is the largest fresh water lake in Canada. ↑ 1.0 1.1 1.2 1.3 1.4 1.5 Wright, John W. (ed.) and Editors and reporters of The New York Times (2006). The New York Times Almanac, (New York, New York: Penguin Books, 2007, ISBN 0-14-303820-6), 64. ↑ Marianne Mithun, The Languages of Native North America (Cambridge: Cambridge University Press, 2000), 312. ↑ Sierra Legal - Advocates for the Environment. 2006. Great Lakes Sewage page 3. Retrieved March 18, 2008. This page was last modified on 20 June 2018, at 14:41.